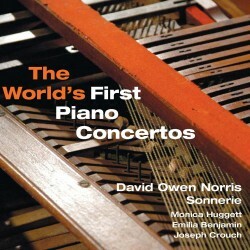 Extensive research by internationally renowned pianist David Owen Norris about a peculiar, tiny square piano that dominated the European keyboard market for about 15 years in the late 18th century, led to his discovery of works written specially for the instrument which constitute The World’s First Piano Concertos. The square piano was the brainchild of a German instrument maker name Zumpe who moved to London in 1761, a time that found composers such as J C Bach and C F Abel thriving in the cosmopolitan English city, and when a precocious Mozart met the former during an early tour there. Inspired by Zumpe’s revolutionary invention, these and other leading composers of the day eagerly wrote a number of virtuoso works that, accompanied by a small string ensemble which would not overpower the instrument’s delicate sound, allowed the keyboard soloist to truly shine. Thus, the Piano Concerto was born in London around 1770. These works, neglected since the demise of the square piano, are here brought together with an equally neglected instrument for the first time on CD.